Gustavo Franco, MD, Hazem Elariny, MD FACS. Inova Fairfax Hospital. Falls Church, Virginia. Introduction: Sleeve gastrectomy (SG) as originally performed with Bilio-pancreatic diversion and duodenal switch (1980-2000) is a non-restrictive procedure (no narrowed outlet) that provides primarily “capacity reduction”. With introduction of Sleeve gastrectomy as an independent procedure, some have used a smaller bougie to accomplish full length restriction of the sleeve. 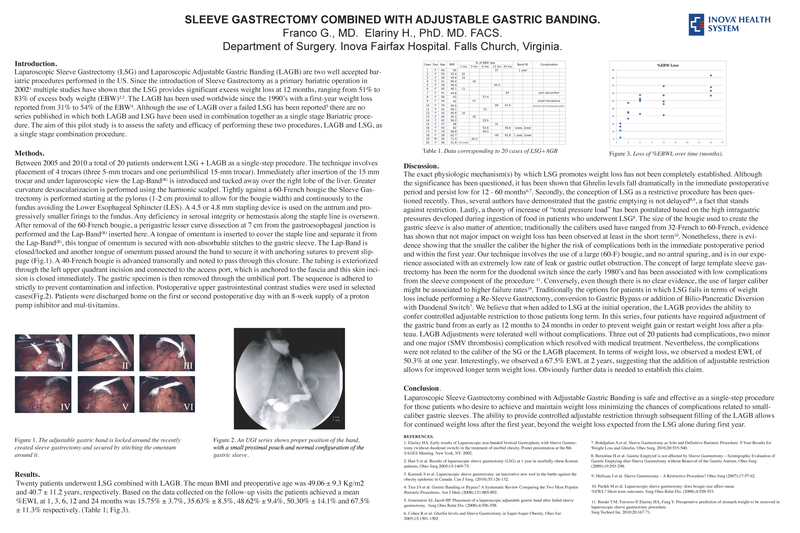 We postulated that the addition of Adjustable Gastric Banding to SG would provide a restrictive component to an otherwise capacity reduction procedure avoiding the complications due to high pressure associated with a very narrow sleeve gastrectomy. Objective of the study/technique: This pilot study assesses the impact on weight loss when a gastric capacity-reduction procedure (Sleeve Gastrectomy) is performed in combination with a restrictive procedure (Adjustable Gastric Banding). Methods and procedures: Since 2005, twenty (20) morbidly obese patients (BMI 40 – 71.4) have undergone SG plus AGB. The SG was created over a 60 F bougie and the AGB was placed at 7 cm from the gastro-esophageal junction and secured by using an omental wrap. Results: After a follow up ranging from 1 month to 2 years, the excess body weight (EBW) loss has been within 11% to 20% for the first month, 31% to 69% for the first year and 56.6% to 75% for the 2-year follow up period. In order to increase restriction, adjustments of the band has been performed in 4 (20%) patients due to plateau of weight loss and/or weight gain, with additional weight loss ranging from 27% to 50.8% of EBW over one year post-adjustment. Complications related to this procedure were AGB tubing leak, pancreatitis, superior mesenteric vein thrombosis and discomfort at the port site after weight loss. Conclusion: SG combined with AGB arises as a reasonable option for accomplishing restriction and desired weight loss in morbidly obese patients in which large bougie SG alone may not be as effective.